Ground Crew, Pilots and Mechanics were all at breakfast this morning for our now 'regular' 9am meeting. This is like 'Ground Hog Day' said Fritz. Ah, I said, I guess that means we're stuck in Bonn for another day. 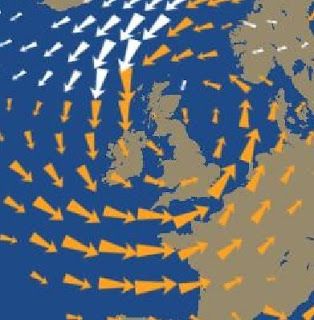 The weather is pretty awful for the next few days, not here in Bonn where the sun is shining, but in the English Channel. 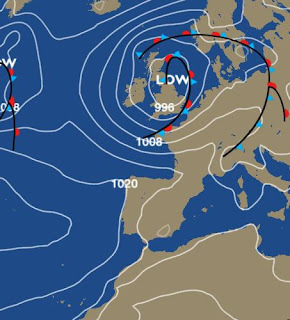 A low pressure is sitting over the UK at present causing very high winds from the SW whistling through the channel. The Bad News is that it looks to be that way for at least the next couple of days, and then another front sweeps in. Someone was asking Fritz yesterday ' but can't this airship travel in 30-40 knot winds?' Yes, it can. But if you fly at 45 knots into a 35 knot headwind, then you'll be going very slowly and burning a great deal of fuel! Pictures from the BBC Weather site. Hey, will you may drive the Zeppelin over Duesseldorf? I would pretty enjoy in looking at it. Or may would you leave a comment when you´re gonna leave London, giving me a chance to watch take of and the fly away.